Home » Around the farm » Aren’t we lucky. We live in a weatherboard farm house. The kind of house that started out as four rooms and a verandah but has had that verandah enclosed and rooms added on over many years. 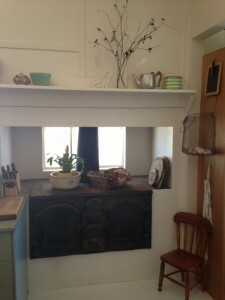 This is the wood stove in our kitchen, still in its original position. Two big bakery-style doors on each side and the wood box in the middle. It hasn’t been used for a few years now, primarily because it needs some internal repairs, but we wouldn’t dream of removing it. Generations of Harrington’s have cooked on it or stood on the hearth to warm their bones by it. I’ve thought about this wood stove quite a bit over the last week or so as we, like many people (both townies and country folk) in Victoria and other states endured a week of 40+ degree temperatures. In particular I was thinking about it while I sat on the back verandah, with my feet luxuriating in the cold water of the full ‘clam shell’ pool. You see, sitting with my feet in cold water was one of my ‘tips’ for keeping cool last week. Letting the smallest farmer play in the water under the shade of the verandah was another. While I am absolutely certain I was not the only person doing this, I decided that I had quite a few ‘tips’ that I rolled out last week to do whatever we could to keep ourselves and the house cool. I opened all the windows and the doors of the house at night to hopefully allow the nightly cool breeze to move the hot air out of the house ready for the next day. This was, unfortunately for me, a rather futile exercise as the night temperatures didn’t drop much below about 30 degrees and there was no cooling breeze! I would close the house up again in the morning to keep the warm air out for as long as possible. I spent a great deal of time making ice in every available ice cube tray and plastic container that would fit in the freezer. I had a large drinker filled with cold water on the bench so we weren’t opening the fridge 45 times a day (although this one is a little challenging when the smallest farmer thinks the fridge is an all-you-can-eat buffet and that you can stand with the door open staring at the items contained within for long periods of time while you make your choice!). Then there was the meal planning – we ate plenty of cold meat and salad and sandwiches …..and super-doopers …… and tried to remember not to leave the butter or the milk on the bench. From a farm perspective, because we knew in advance that the heat was coming, the week before all the stock had been moved into paddocks with extra shade and plentiful fresh water, not just relying on muddy dams or single water troughs. Farm work was started early in the day, around 5am, and finished by lunchtime. And, when it all got a bit too hot for us, we got in the car, turned the air-conditioner on and went to the Goornong Pool. Tim’s grandmother raised 18 children in the original four rooms of the house we live in. While the boys slept in a hut (weatherboard walls, tin roof, fireplace at one end) down the yard that was lined with bunk beds, everyone else slept in the house. No electricity – no air conditioning. The ice-man didn’t make deliveries out here. Cooking was all done on the wood stove, irrespective of the temperature outside. Two wheelbarrows of wood would have been chopped each day to keep it going. Food was kept in a koolgardie safe. There is a song that is sung at the annual ‘Back to Fosterville’ which references everyone going swimming at Harrington’s Hole – the billabong at the bottom of the hill below the house. I’m pretty sure that while Grandma Harrington may have gone down to the river and possibly even dangled a toe in, that she didn’t don her cosi and get in for a swim. So while contemplating all of this last week, I marvelled at what a woman Grandma Harrington must have been. Not least because she had 18 children but also because she must have had some pretty good tips for keeping herself, her children and her house cool in hot weather.